A plan to release beavers into the Forest of Dean has been approved by the government. 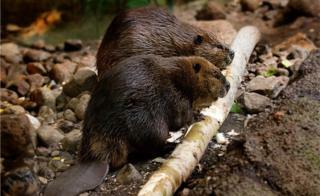 Two adult beavers and two kits will be released into a 6.5 hectare (16-acre) enclosure at Lydbrook, Gloucestershire. It is hoped the four animals will help prevent flooding in the area by improving biodiversity and building dams and ponds. They will be released next year under Forestry Commission plans approved by Natural England. Environment Secretary Michael Gove said: "The beaver has a special place in English heritage and the Forest of Dean proposal is a fantastic opportunity to help bring this iconic species back to the countryside 400 years after it was driven to extinction." Kevin Stannard from the Forestry Commission said: "We will continue our detailed planning including designing a robust fence to keep the beaver enclosed; securing healthy, disease-free beaver and collecting data from the monitoring of the water flow in the brook." Scientists believe the beavers may be able to hold back enough water to help with flood alleviation for Lydbrook by quickly constructing natural dam structures and creating new habitat. Natural England said it will consider further applications for possible trial releases "on a case by case basis", in line with new Defra guidance. Beavers were hunted to near-extinction for their highly valuable fur and oil, but have survived in captivity. Their reintroduction will be be the first time the animals have been seen in the Forest for 400 years.